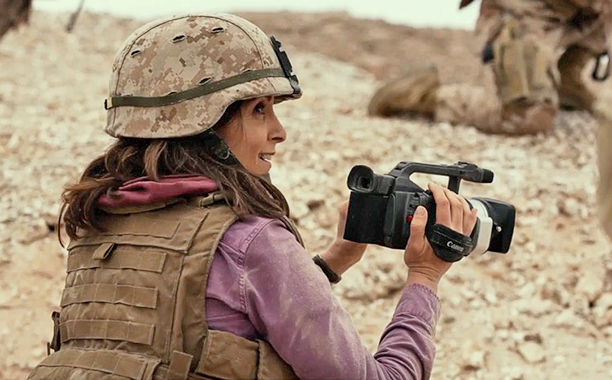 Given the subject matter – reporter Tina Fey gets out of her rut in NYC by going to cover the war in Afghanistan circa 2003 – it’s amazing they managed to make such a boring film. The first error is casting Fey, who can barely get one inch past her Liz Lemon character from 30 Rock. She’s little more than a smirk and a wink, so any transformation in or development of her character is simply impossible, and when she starts an affair with photographer Martin Freeman, she seems as put-off by the experience as the audience. Their love scene is akin to two kangaroos boxing, and further suggestions of coitus are shown the morning after, where Liz Lemon is hungover and horrified she may have slept with Griz. So, we are left with a culture clash flick, with Fey repeatedly doing things most people in Afghanistan would not like, such as walking around without headcover, and holding hands publicly with Freeman, and filming things surreptitiously under her Islamic garb. Also not very good. Although it does have the value of being surprisingly politically incorrect – the indigenous folk are primarily used as pratfall props while the Westerners are amused and snide, and in what has become the cardinal sin of Hollywood, non Afghanis are (gasp!) cast as locals – none of it rings true, which is a particular problem with a film based on a true story. The film closes with a violent lurch to a Bin Laden type rescue of Freeman, orchestrated by the plucky Fey, to “Can’t Live” by Badfinger (or Harry Nilsson) and a treacly visit to a maimed Marine for whom she feels responsible but whose aplomb helps her become more grounded. It’s just godawful. The film has two directors, neither of whom knows what he is doing, which they demonstrate repeatedly over the picture’s excruciating two hours. Billy Bob Thornton is the only saving grace as a gruff Marine officer who shepherds Fey around, but his screen time is limited.